Villa Dolunay Apart Hotel rests in the heart of the picturesque harbour side town of Dalyan, just a 5 minute walk from the harbour and close to plenty of shops and restaurants. Surrounded by beautiful gardens and singing birds, this 3 Star property is great for couples and families with 10 comfortable one bedroom 4-share apartments all with modern amenities. Guests to the Villa Dolunay Apart Hotel can visit the ancient City of Caunos and Rock Tombs, explore delightful villages nearby and experience real Turkish hospitality. 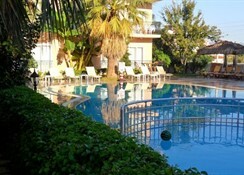 Getting to the hotel: The hotel is 80 km from Marmaris, Fethiye is 75 km and Dalaman Airport is 25 km from the hotel. Local Tips: Visit nearby Iztuzu beach (11 km), one of the worlds few remaining breeding grounds for Loggerhead (Caretta Caretta) turtles, and an area of astounding natural beauty. 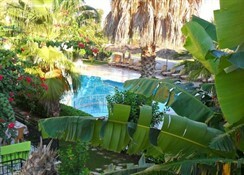 Food, drink and entertainment: Self Catering accommodation with an option for Bed and Breakfast. 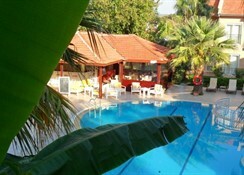 The Villa Dolunay Apart Hotel has a cute little café restaurant, a lounge with TV, and a pool snack bar with elegant and delicious dishes of Turkish cuisine. 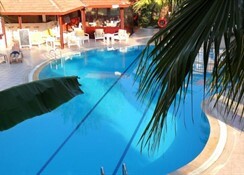 Sports, games and activities: Large Jacuzzi pool, sun beds and umbrellas. Nearby activities available through private operators include Scuba diving, site seeing, and boat tours that can arrange short planned trips to Mud-bath, Koycegiz Lake, Caunos Ruins, Turtle Watching, for Rent and for Bird-watching. 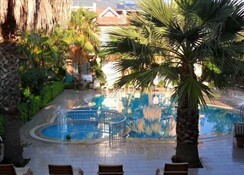 Additional: 24-hour reception, friendly staff and excellent service, car park. The Villa Dolunay Apart Hotel features one bedroom 4-share apartments with one bedroom and one living room, either 2 single or double bed, wardrobe, dressing table, bedside tables, American kitchen with refrigerator, cooker, kitchen equipment, air conditioning (extra charge payable locally), two sofa beds, and a balcony overlooking the pool and gardens. Free baby cot available on request.